I’m Anna. I am married to a wonderful man and have a beautiful 2 year old daughter. Our lives, just like everyone’s, are crazy busy, but in the midst of that I love to clean, I love to organize, I love to decorate. I also love to help others do the same. For years people have asked me questions about cleaning, meal planning and other household things. I decided to start compiling these questions and blogging about them to help out as many people as possible. You can find me at Ask Anna. I love the feeling that a clean, organized and beautiful home brings. My desire is that everyone can experience this feeling. Cleaning, organizing and decorating don’t have to be hard and they don’t have to be “chores”. My wish is to teach you the tools to make these things easier so that you can spend more time enjoying your family and be proud of the space you live in. So of course I had to find a solution! 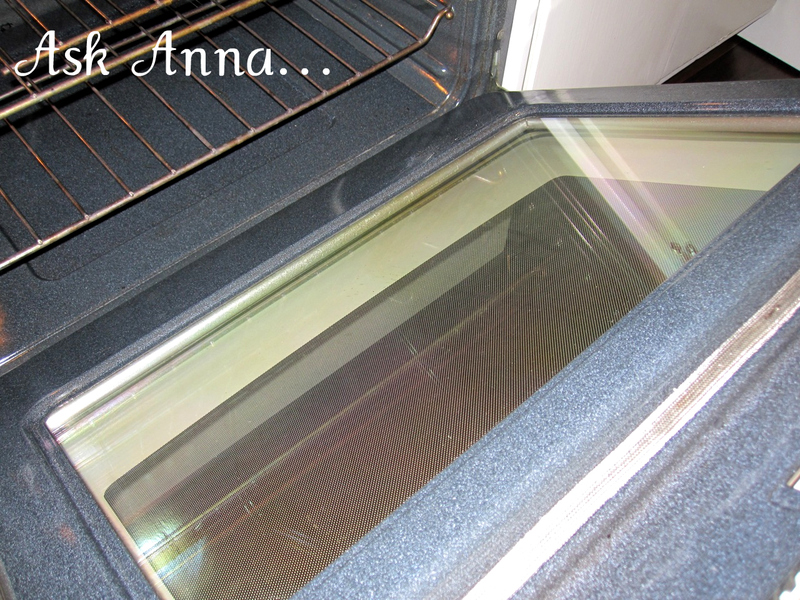 Because having oven glass that looks like this, or worse, is just not acceptable. I needed to find a solution for my reader, but also for me! After a little research I found this video on You Tube. I was extremeley skeptical because it just seemed too simple so I had to test it for myself. All you will need for this is baking soda, water and something to mix them in. Step 1: Pour about 1/2 cup of baking soda into a dish and slowly add water to it until it becomes a thin paste. You don’t want it to be too thick because you want the mixture to be easy to spread. Step 4: When 15 minutes has expired use a clean rag (I used a damp wash cloth) and wipe up the baking soda mixture. You will be amazed at how easily the grime just wipes right off! If you pull out the bottom drawer and look up the bottom of the door (I am thinking you will need to be laying on the floor unless there is an easy way to get the door off) you will see a couple of hole slats. Take a coat hanger or long ruler and, with duct tape, attach a cloth or paper towel dampened with glass cleaner or other cleaner of choice and stick it up one of the slats. I found this tip here. Anna, you always have awesome ideas! Thanks for sharing with us, again! do you not even turn the oven on? I will have to try that.